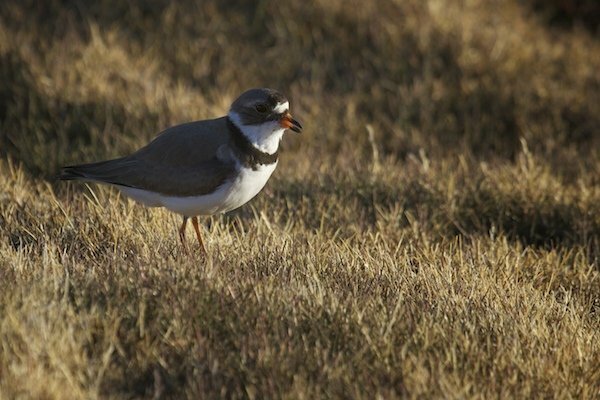 I’ve written before about the two near identical plovers that breed here in Arctic Bay, The Semipalmated Plover and the Common Ringed Plover. I live in one of the few places in North America where both species breed and occur regularly. Conventional wisdom, up until a couple of years ago, was that the two birds’ breeding range overlapped only in a narrow area in the middle of Baffin Island. 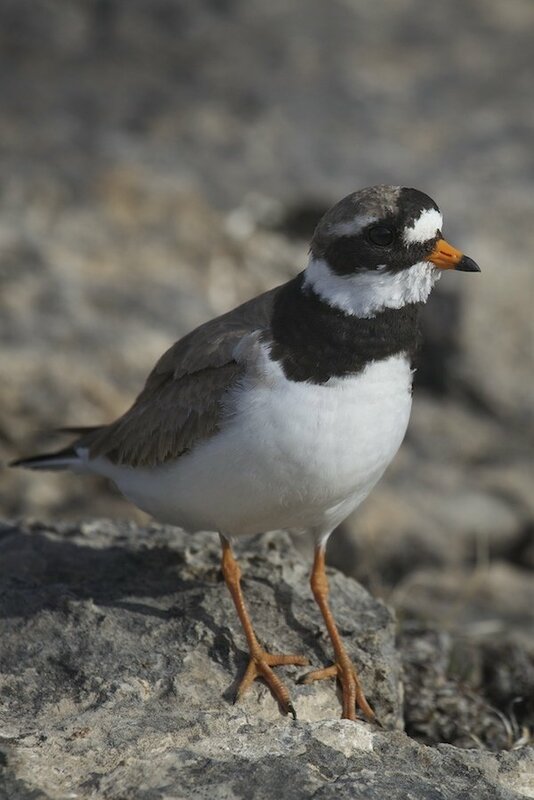 It was thought that, in the Canadian Arctic, Common Ringed Plovers nested on the north half of Baffin, and Semipalmated Plovers on the southern half of the island. It is a big island, by the way, the fifth largest in the world. But the occurrence of both here presents identification challenges, after all as I said before they are nearly identical. Sometimes they are found in the same location at the same time, my first encounter with both species this spring had both species within 15 feet of each other. Even with the birds that close it is challenging to tell both apart. Voice is a good indicator, but if you’re like me and need several opportunities to hear a bird and then check with recordings before you’re comfortable… well. And what do you do if the bird you’re watching is mostly silent? I’m going to show you some of the things I look at to tell the two species apart, and explain why I try and get good photographs of their feet to seal the deal when I get home. One of the best indicators I’ve found here is the presence or absence of a yellow eye ring. 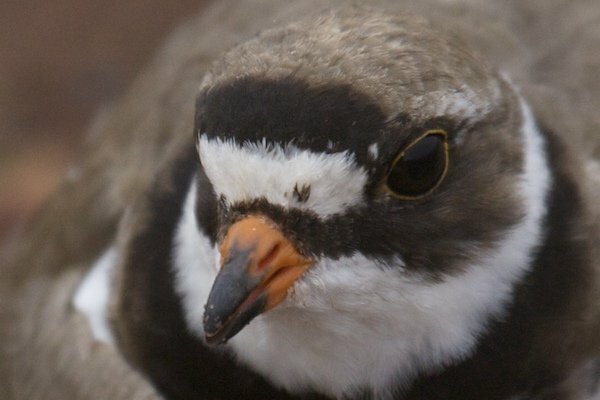 So far, I’ve found that if the bird has a yellow eye ring, it is a Semipalmated Plover. The birds without one have all been Common Ringed Plovers, the birds with, Semipalmated. Most of the easily noticeable plumage differences can be seen on those two head shots as well. In general I find that the Common Ringed Plover’s black and white markings are bigger and bolder. Note the white patch above the eye. On Semipalmated Plovers this patch almost seems to be an afterthought, sometimes barely more than a smudge, but on Common Ringed Plovers it is large and prominent. The other plumage feature that is larger and more prominent on Common Ringed Plovers is the chest band. 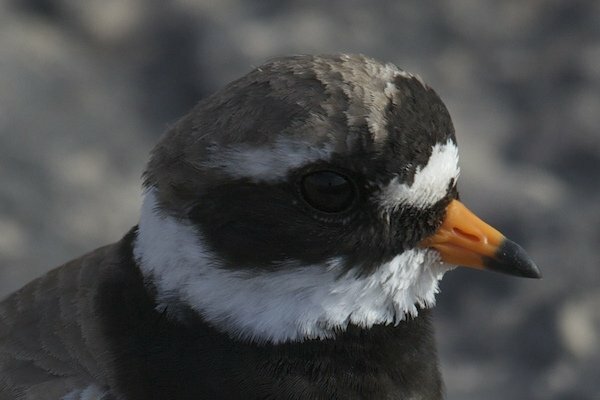 Take a look at this female Semipalmated Plover and note the size and prominence of her chest band. Now look at this Common Ringed, also a female, with her chick. The band is bolder and a little thicker. 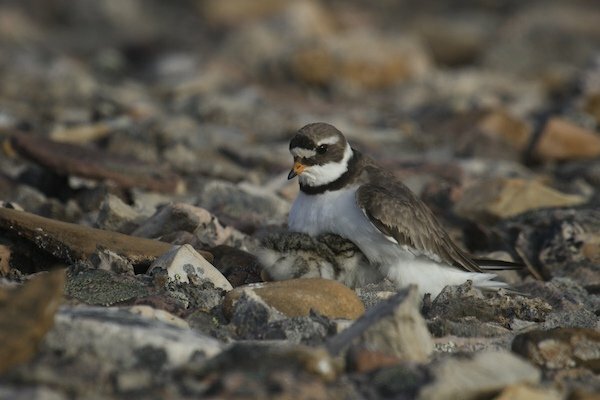 Common Ringed Plover and chick. But there is one way to truly separate the two species, the reason I try and get photographs of their feet when I am unsure. It is difficult to see in the field, with the birds moving about, which is why most guide books talk about separating them by this feature “in the hand”. I overheard my son (who turns ten years old today) tell a visitor how to tell the two species apart. So I’ll let him explain the difference in the two species feet. “Was it a Common Ringed Plover? 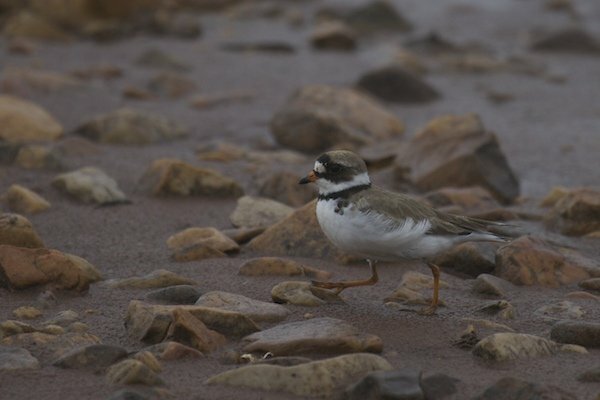 Common Ringed Plovers have webs between only two of their toes, Semipalmated have them between all three toes”. And there you have it. The sure way of separating the two, should you manage to get a look at their toes. Feet of Common Ringed Plover. Note the webbing between the outside and middle toes. This isn’t the best photo of Semipalmated Plover’s feet, but it is the photograph that got me to realize that contrary to conventional wisdom, not all the plovers up here were Common Ringed Plovers. In fact my observations are that Semipalmated are more common here. Feet of a Semipalmated Plover chick. 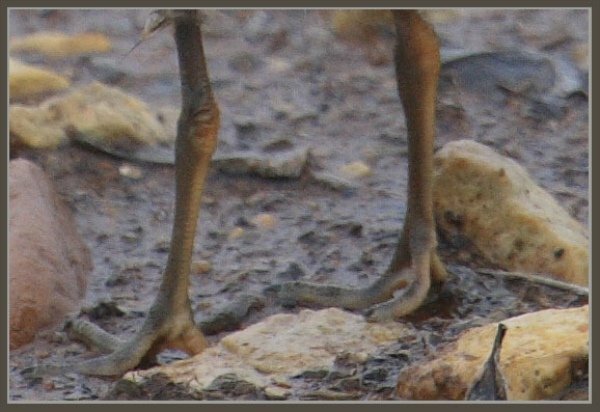 More typical of the photos you get in the field, but the webbing between the inside toes is visible. That webbing is absent in Common Ringed Plovers. Great photos and educational post Clare. Birders in the lower 48 need all the help we can get telling these two apart! Thanks for this guide, and great photos! I now feel prepared to find a Common Ringed Plover at Jamaica Bay this August. Well done, Clare. I’m glad you shared the ID tips about the eye rings and markings, because I’d rather miss a bird entirely than have to determine which of its toes have subtle webbing. Thanks Felonious, John, Corey, and Mike. 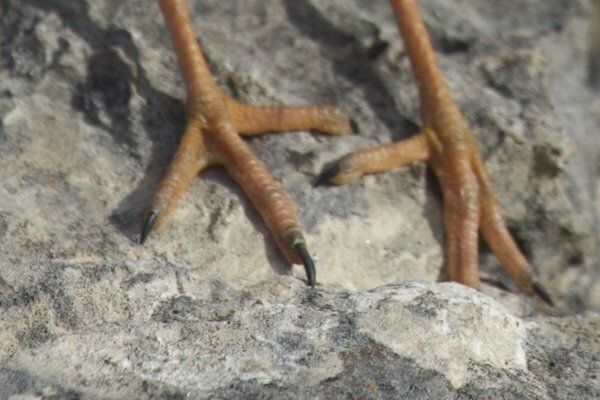 You should all come up next July for my “How to photograph bird toes” workshop. Admission is free. Thanks Pat. One of the cool things about birds is you just never know where an unusual one will show up. Good luck. Thanks Genine. When I found that there were Semipalmated Plovers here it was at a location I always sent others to so they could see Common Ringed Plovers. One was a cinematographer. I had him check his film and sure enough the birds we thought were Common Ringed, were actually Semipalmated. So the Ringed have no eye ring and the Semipalms have rings. Makes sense to someone. Anyhoo, great post. Thank you. Here’s a shot of a Ringed (I think) from northern Iceland, near Akureyri.